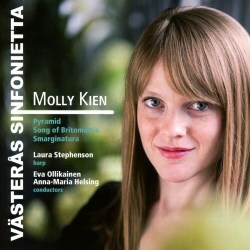 Molly Kien is a Swedish composer new to me, but one with an impressive and distinctive voice. The idiom of these orchestral works is undoubtedly and unabashedly modern, but with moments of particular beauty. I look forward to hearing more of her work: she has something very distinctive to say. The three works here are different from each other, but each demonstrates excellent command of orchestral colour and also of mood. Pyramid was inspired by “Altar Painting No. 1”, a work by Hilma af Klimt which shows a colourful pyramid rising to the sun. The piece starts with high notes, followed by drum beats—a theme which recurs and provides rhythmic impetus. There is a touching solo for violin at the heart of the piece. For me, the highlight was the second work, the Song of Britomartis, here performed live by the Canadian, Laura Stephenson, principal harpist of the Stockholm Philharmonic. It was premiered in 2009 and was also played in London later that year. This recording is of a revised version. There is so much to admire, not least the understanding of the capabilities of the harp. The inspiration for the work was classical - Britomartis is a Minoan goddess - as represented by a rug in the Stockholm Concert Hall. One hears echoes of fauns playing flutes and mermaids with their lyres. The longest work, Smarginatura, is based on a series of novels by Elena Ferrante. In the first, My Brilliant Friend, a character experiences “smarginatura”, a dissolution of margins. The music contains various blending effects, with changes of phrases and dark undertones. I have not heard it sufficiently often to uncover more than a few of its insights, but each hearing has revealed more riches. Recording quality is excellent, and notes are informative, but the main joy is the music itself.